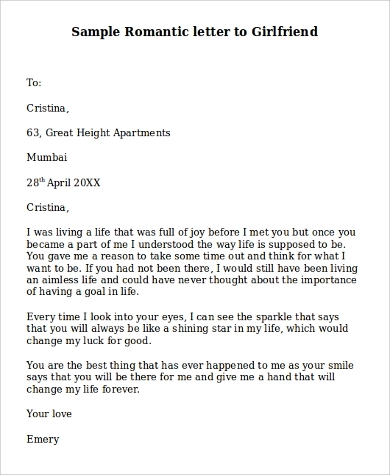 A love letter for a girlfriend should be written in an informal language on a simply formatted template. It may be an Apology Love Letter. Starting by affectionately addressing her in the Love Letters for Her, it should express the writer’s emotions as to how his better half has made a difference to his life by reassuring his love for her. Women are not the only ones who appreciate it a lot when it comes to Romantic Love Letters. 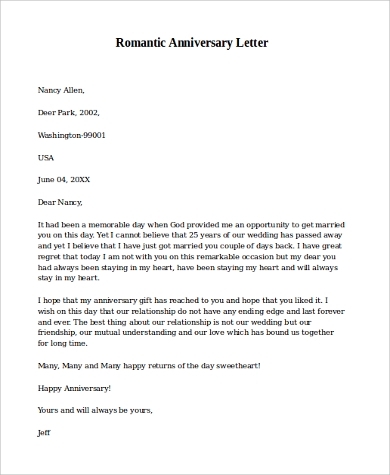 If you face difficulties in expressing feelings for our boyfriend, then make use of this template to write down a carefully worded letter, whether it is for the first time or just a remembrance after many years. Receiving love letters in a happy married life ensures its survival over many years to remind each other of the love in between constantly. The writer should focus on complementing on a certain inspirational character of his wife in a love letter for her and go on to conveying his feelings about how their love has matured with time. 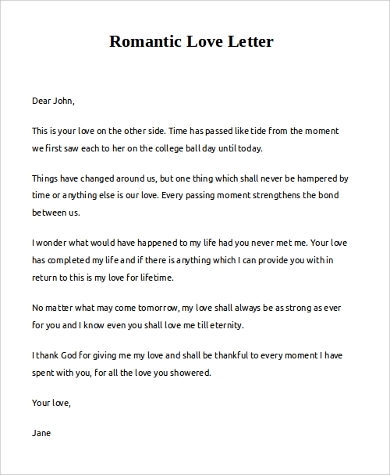 What are the benefits of writing a Romantic Love Letter? Writing Romantic Love Letters is a dying tradition. Most of us use the electronic medium like chats and text messages to get our feelings across. However, something gets lost in the process, and even the emotions flow mechanically. Writing a heartfelt letter brings about our true feelings about the other person and provides us with a closure of our sentimental values. Unlike a text message, a letter flows through as long as we want. A love letter expressing someone’s love for the first time also gives the recipient time to gather their feelings and reciprocate accordingly. All those afraid of a face-to-face confrontation can pen down all their thoughts easily without hesitation. Proclaim your love even after days spent together in each other’s company. This template shows how spouses or lovers wish for each other’s love to grow stronger in the coming years and expresses gratitude to the other for being by their side even in testing times. 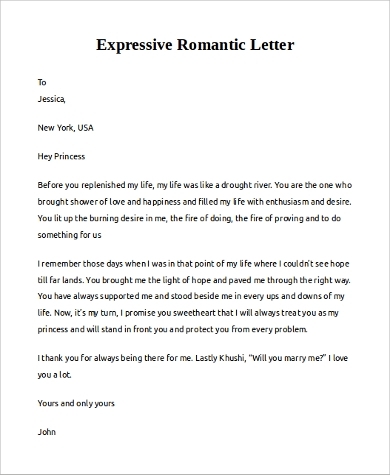 Writing a letter to the man of your life acknowledging your love for the first time or just reminding him of the times cherished together can be executed through this sample. 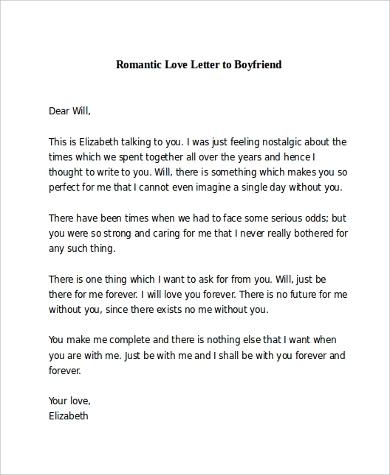 It is advisable to write Romantic Love letters that he expects from you and not something you would expect from him. Do not be overly sentimental but be sure to thank him for all the things he does for you. Who are is the target audience of these Romantic Love Letters? In this century, very often so we find people completely in sync with their feelings or capable of letting their feelings known in the most subtle yet convincing way. When you write a love letter, it is crucial to know the person for whom you are writing it for. The style and vocabulary depend on the audience. When you want your beloved to read a letter, you would want him/her to get excited and feel special. 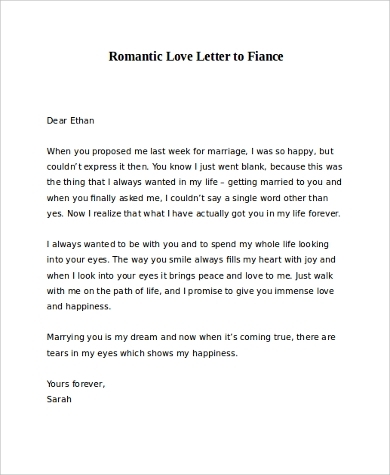 Romantic Love Letter templates come to the aid of all those people who hesitate to get their feelings across in a direct way. For individuals who fear rejection, this is an excellent way to avoid the hurtful consequences in a face-to-face confrontation. Writing letters is a fading art, which makes it all the more special for the recipient. Whether they are Love Letters for Him or for her, it comes with different purposes and feelings, changing according to the context. The writer should make an extra effort to include all the little things that made their lives the way it is. However, love letters need practice and patience to be excelled at. To start out, writers may take preliminary help from different samples of templates to make their attempts successful and making their partners know how much they value the other.